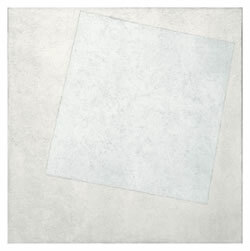 The all-white, uninflected canvas functions as a site of suggestion, a space activated principally by the imagination. It's also - historically at least - a focus of protest, an arena explicitly concerned with the dissolution of image and emergence, in its place, of concept. 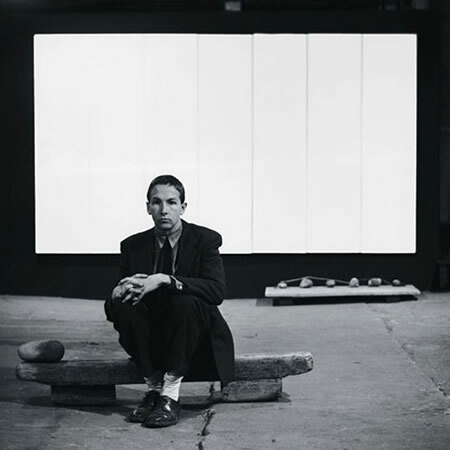 As early as 1918, Russian Suprematist Kazimir Malevich approached the possibilities of all-white painting with his White on White (left), but it was not until 1951 that American artist Robert Rauschenberg produced entirely monochromatic white works (below) . 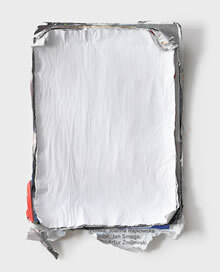 Applying household paint to canvas with rollers, Rauschenberg achieved smooth, uninflected surfaces that provided the first instance of a visually 'blank' pictorial space; a bold delineation of absence that was quickly adopted by other artists and adapted to a wide variety of mediums. If many of these early works seem predicated on uncompromising reduction and an implicit emphasis on negation - a radical break with historical precedent and complete renunciation of representational painting - more recent formulations suggest a shift away from such intent. Instead, contemporary versions of the all-white image frequently embrace rhetorical function, implications of underlying narrative or even, in some cases, astute critical assessments of the trope itself. 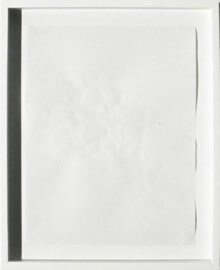 Subject to ever-widening contextual inflection, the nominally empty canvas remains a surprisingly current artistic motif. 1.  Several artists had, before this date, created instances of entirely monochromatic painting, but not yet taken the step of using the 'blank' non-colour white. "I reduced painting to its logical conclusion and exhibited three canvases: red, blue and yellow. I affirmed: it's all over. Basic colors. Every plane is a plane and there is to be no representation." Yves Klein's own experiments with monochrome painting predate Rauschenberg's by several years: in 1949 he completed various monochromes in a variety of vibrant hues. However, the first exhibition of this work, in 1950, was private; similar examples were made more widely known in 1954, with the publication of his artist's book Yves: Peintures. The content of this painting is invisible: the character and dimension of the content are to be kept permanently secret, known only to the artist. With these words, Art & Language - a collaboration between various artists - manage to pose an almost unfathomable series of conundrums regarding our interpretation of their artwork. Although the canvas seems absolutely reminiscent of a white monochrome (versions also exist in black), we are clearly informed this isn't the case: the 'real' painting is not only invisible, its dimensions may vary from the non-work presented. 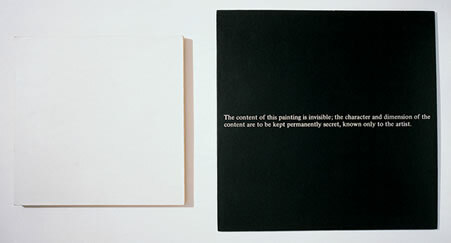 Moreover, any use of its blank space as a springboard for our own suggestive projection is expressly disallowed; in a radical enforcement of authorial control, we are told that there is, essentially, only one possible manifestation of this painting - which, since it remains 'a secret', we can never be privy to. Aptly applying the mechanics of language to conjure complete invisibility from an already blank space, Art & Language's manoeuvring converts presence into something entirely immaterial - a painting which cannot exist even in our own minds. 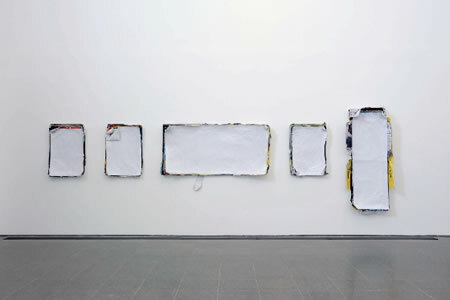 In addition to several wryly comic examples of immaterial (or nearly so) sculpture, Friedman has also produced various riffs on the empty / uninflected canvas, each of which roguishly invokes art historical precedent as well as more seriously tackling the logic - or otherwise - of viewing the invisible. 1000 Hours of Staring (1992-97, above) is satirically construed to be permeated by artistic presence - perhaps alluding to documentary film footage of Yves Klein's earnest perusal of the "invisible paintings" on show at his seminal 1958 exhibition 'The Void'. Yet Friedman's 'stared-on' paper sheet serves equally as an artefact of performance; the nature of which, while emulating countless pared-down precedents, is subtly aligned with the pointless and prosaic. Unavoidably conjuring associations with the common phrase 'staring at a blank sheet / screen' (etc), 1000 Hours... very clearly suggests an origin in non-productivity rather than inspiration. And as if such inferences weren't scathing enough, the act on which 1000 Hours of Staring is predicated also anticipates and parallels the gaze of the viewer - although there's little doubt that Friedman seriously expects anyone to contemplate the work for anything like the amounts of time involved in its making. Friedman's construction of an artwork from the vestiges of a heavily implied creative hiatus is, therefore, as problematic as it is undeniably amusing. While serving to acknowledge (and perhaps even obliquely celebrate) a history of immaterial and non-visible art, Friedman complicates the paradox of fulsome nothingness by seeming to suggest that, with this work at least, there's actually very little to it. (For more work by Friedman, see also Invisible Artworks and Additive Subtraction). Swedish artist Klara Lidén initiates interventions into urban space that question the often uneasy co-existence of private and public territories and the legitimacy, in many cases, of such delineation. Her series of negated advertising posters (which could also have featured in our section on erasure and excision) forcibly focuses on the commercial use of public space; an insidious sales pitch that's impossible to avoid. By coating hoardings in white paint (the thickness of accumulated postings attesting to the magnitude of constantly renewed propaganda) Lidén brings their messages to an abrupt halt, providing, instead, a blank canvas onto which passers-by can project unmediated needs, want and desires - or even, grafitti-style, add their own impromptu artwork. New York-based Swiss artist Bruno Jakob has dedicated much of his long career to the production of 'Invisible Paintings': works achieved by exposing paper or canvas to various elements that leave little to no trace of their presence. While many of these mediums (Zurich snow; Venetian rain; light; air and even the tracks left by snails eating their way across paper sheets (above) are unconventional yet plausible, Jakob's additional espousal of 'brain air', 'love' and other intangible phenomena can prove slightly more challenging. 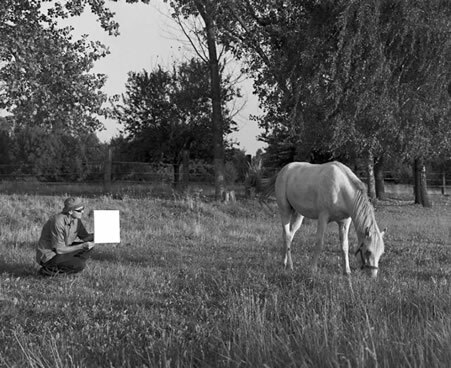 Untitled (Horse) (above), for example, is predicated as a kind of psychic portrait captured simply by holding a blank canvas in front of an equine subject. 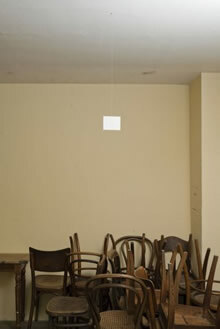 In similar fashion, Weisses Lächeln (White Smile, 2010, left) sets about imbuing a strung-up paper sheet with a variety of phenomena including 'brainwaves','thoughts of painted images', 'breathing', 'air', 'light' and 'maybe many ingredients' besides. Yves Klein, yet again, largely preempted such metaphysical art-making, not only by famously insisting on the artistic validity of his own aura, but also through referring to "impregnation" rather than painting with regard to his blue monochromes, which he apparently regarded as embodiments of some kind of mystic force . While Jakob's practice pushes the art of the conceptualised image into what many would regard as equally wacky realms, there's nonetheless something seductively engaging about an artist who appears to posit such a profoundly cosmic relationship with the world, while equally insisting that the deep trust we place in visual evidence may well be more absurd than his attempts to negate it. 2. Korean artist Lee Ufan was actually one of the first to build on this precedent with his 1969 work Things and Words (below), in which he exposed three sheets of Japanese paper to the elements outside Tokyo's Metropolitan Art Museum before finally exhibiting them indoors. Much of Glenn Ligon's work refers to his own experience as an African American gay man, most notably exemplified by text-based drawings and paintings that are neither black, nor white, but a patchwork of the two. By contrast, He tells me I am his own leaves little doubt as to its monochromatic status. 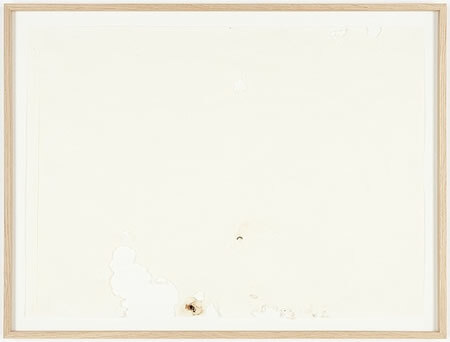 Consisting of glossy white photographic paper on which, of course, no image is recorded, it seems to serve not only as an absence, but as overwhelming presence: a figurative snapshot of majority America, its white so intense that it obliterates everything else. This is just one reading of Ligon's piece, which is enigmatic enough to suggest several. Its title, for instance, is taken from a gospel hymn - a particular favourite amongst black Evangelical church-going communities. It has been recorded by many artists, although versions sung by 'mainstream' white performers such as Elvis Presley, Rosemary Clooney and Perry Como are probably amongst the best known. Such references also raise the possibility of viewing the white space in Ligon's work as emblematic of God's grace, a holy force; yet the paradox of its emptiness and Ligon's personal history as commentator makes this unlikely. If the motivation for Ligon's adoption of a Christian hymn is left uncertain, the issue of who, exactly the 'He' in Ligon's title refers to becomes equally intriguing. If, as seems possible, Ligon reassigns its meaning to encompass the experience of his own sexuality - a bold and potentially polemical move given the hostility of many factions of the Church to homosexuality - his piece takes on yet another dimension, albeit one again mediated via the insistent lack of representation that permeates his imageless photo. Gianni Motti's interventions include organising meditation sessions for London 'policemen' at an art fair; (purportedly) commandeering a bus of Japanese tourists in order to steer them to an exhibition; and hiring a medium to evoke the spirit of John Lennon. Underpinned by a similar officious absurdity, Motti's 'Magic Ink' drawings (1989, above) are as ghostly (and ultimately unproductive) as the Lennon seance; preposterous yet somehow purposeful proposals which disappear almost as soon as they are produced. Warhol also, apparently, produced temporarily inaccessible pornographic drawings in inks that would fluoresce into view under ultraviolet light. More recently, French artist Loris Gréaud has created a similar series of works painted with invisible ink. His 'Vanishing References Portrait Series' (2007–8) pays unverifiable homage to the artist's personal heroes including Marcel Duchamp, John Cage and Buckminster Fuller. Catalan artist Aballí has long concerned himself with investigating the various presences - physical or otherwise - that lie behind perceived absence. His Components de l'aire for example, (2011, detail left) lists the many substances of which air is composed, underlining the fact that 'thin air' is actually bristling with presence. 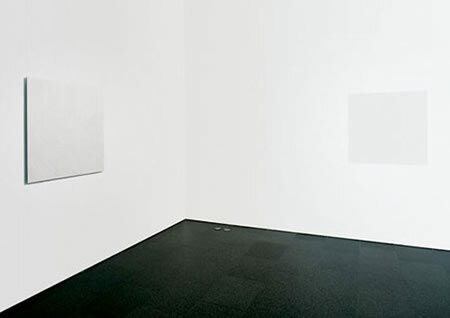 By contrast, the two all-white works shown here operate by masking an underlying object or image; presences which, although unseen, remain absolutely integral to Aballí's gestures. Big Mistake (1998–2005; above, right) consists of a square of correction fluid covering a square of black paint. While both layers of colour inevitably muster association with the radically reduced historic monochrome, it's unclear whether Aballí's title implies a particular preference for either. His "big mistake" logically seems to refer to the 'corrected' black image, but its very deletion could also be premised as a belatedly realised error of judgement. In fact, it seems most likely that the mistake Aballí alludes to consists precisely of such attempts to prioritise absence over presence: his artistic emphasis is very much on the symbiosis of both. Correcció / Correction (2001, above left) also masks an underlying surface - in this case, a mirror - which is again concealed beneath a layer of correction fluid. 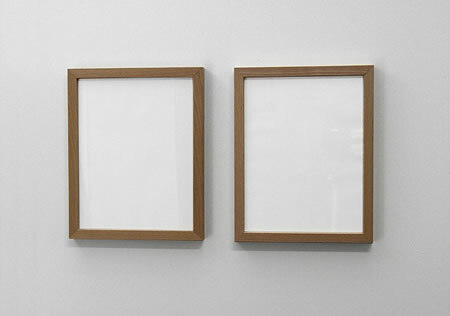 The work's completion invokes a gradual disappearing act (left) that preempts the total non-reflection of subsequent viewers. Once again, the title of the work is enigmatic: while Correcció obviously refers to one of the materials involved, it also seems to suggest that a mirrored surface is intrinsically 'wrong'. What's certain, however, is that Aballí's intervention replaces reflected presence with a 'blank' surface that's paradoxically more substantial than a mirror's illusory depths. Other, fascinating, works by Aballí depart from the use of white space although clearly merit inclusion in this appraisal of artistic absences. Tomar medidas (Taking Measurements, 2009), documents nine instruments measuring things we cannot see, such as temperature, electrical fields and radiation (detail below). 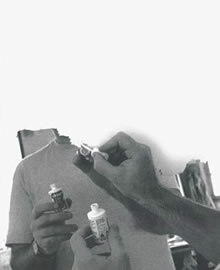 To show (nothing), (2011, detail below) consists of enlargements of newspaper photographs in which the subjects' gestures likewise seem to indicate physical measurement of objects unseen and unknowable. The fact that such movements rarely, of course, imply anything of the sort, but are used instead to enhance verbal communication, complicates the work further. If human gesticulation is largely concerned with enforcing ideas, it defines no-thing - and something - simultaneously.